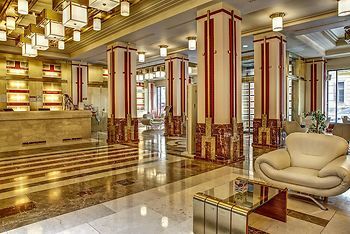 Hotel Majestic Plaza, Prague, Czech Republic - Lowest Rate Guaranteed! Located in Prague (Prague 1), Hotel Majestic Plaza is within a 5-minute walk of Lucerna Palace and New Town Hall. This 4.5-star hotel is 0.3 mi (0.4 km) from Wenceslas Square and 1.7 mi (2.7 km) from Mucha Museum. Excellent location, helpful staff, comfortable and spacious rooms and great breakfast, all for a very reasonable price. We were vwey satisfied with your hotel and would really like to visit you again. Espesially your helpful and friendly staff. I just booked rooms for my guests, collegues, partners who come to work in Prague. But from my experience, it's a nice hotel which has good location and services.